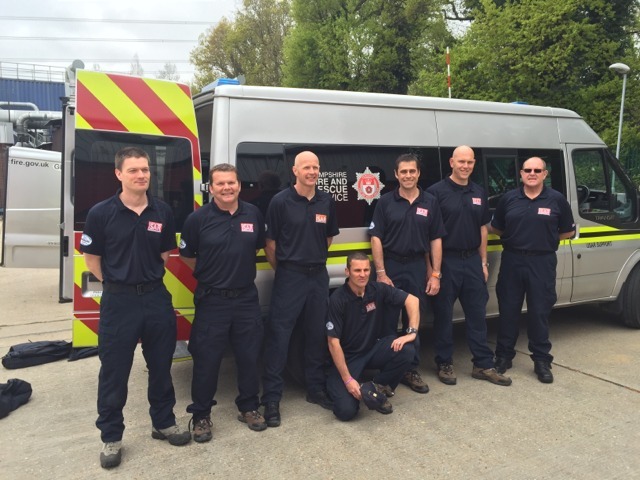 Specialist Fire Fighters and Officers based at Eastleigh’s Hampshire Fire and Rescue HQ are flying out to disaster struck Nepal tonight to join in with an International rescue mission. At least 2,500 people were killed as a result of the 7.8 magnitude quake that struck on Saturday . Many thousands more are without shelter or are sleeping outside in freezing temperatures through fear of fresh tremors as rescuers continue to work through the debris of shattered buildings in the hope of finding survivors. The UK’s Department for International Development has deployed a team of more than 60 search and rescue responders and medical experts as part of a cross-government capacity surge to support the relief effort in Nepal, International Development Secretary Justine Greening announced this evening. The Hampshire Fire and Rescue contingent will form part of the UK-ISAR team – part of a £5 million package of support from the British government. Experts from leading aid agencies including the British Red Cross, Médecins Sans Frontières and Map Action, an international disaster mapping charity. They will join the growing international aid effort in Kathmandu and help direct much-needed assistance. “Our thoughts are with all those affected by this terrible earthquake. The UK is doing everything it can to help Nepal recover and provide assistance to British nationals caught up in the disaster.